I have been to Yeoh’s Bak Kut Teh for a couple of times now; I even recommended it as part of the itinerary for a foodie day in Sheung Wan (guest post on Sparklette.net). However the few visits after my first one was some rather disappointing affair. They were just not as good as my virgin experience. Was I blinded by my thirst for something from home? Or am I missing something here? Unwilling to write off Yeoh’s as yet another faux Malaysian-eatery wannabe, I returned for lunch one weekend with my better half. And boy was I glad I did! The food quality has improved by leaps and bounds, perhaps my best experience yet at this somewhat small restaurant. Let’s take a stroll down memory lane – I ordered the very same set of dishes like my first time. A strange combination, I know, but it works. 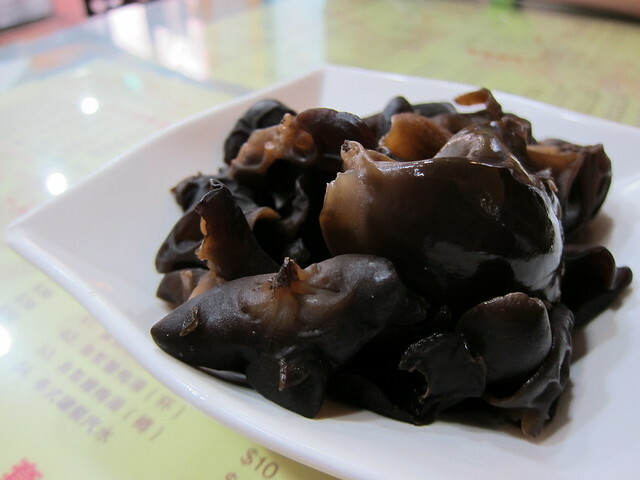 The black fungus (or mook yee in Cantonese) was served cold but crisp. Dipped in wasabi with soy sauce, it was deliciously refreshing. Every piece is crunchy to the bite, you can’t help but wonder… who would have thought a cold dish is served as appetiser in a Malaysian restaurant like this?